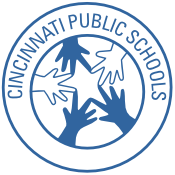 CANS / Clifton Area Neighborhood School serves families in Clifton, Spring Grove Village, Clifton Heights, University Heights and Fairview, giving our children guaranteed access to quality public education. Community Engagement continues for curriculum models and school facility development. CANS hosted a charette with UC DAAP Landscape Architecture students to study concepts for nature playscapes. They presented concepts to the community on April 14 at CCAC, where 50+ attendees contributed additional ideas for development. We’ll deliver these to CPS Facilities as they prepare for renovations. CANS Advisory Group works with CPS top administrators to establish goals for the size of our student body and best uses of the permanent facility. Statistical studies confirm that CANS families will always represent broad cultural and economic diversity, establishing our school’s core identity and driving our curriculum. Partnerships are key! University of Cincinnati DAAP UC art education teachers and students have created a special project with CANS Kindergartners; UC School of Education helps with development of our curriculum; Kindergartners learn Spanish with UC professor Andres Simon-Perez; UC Classics staff supports research of Rawson Farmhouse. More strong partnerships will develop within CANS’ Community Learning Center, inviting interaction with all residents. Expeditionary Learning is now our preferred curriculum model. CPS has three schools using this approach, described as “Learning by Doing.” Students actively participate in lessons and social/environmental service activities. ”EL” not only develops solid academic engagement and achievement, but also critical thinking, problem-solving, independence, collaboration and leadership.